Open deserts provide space for minds to play, connect and revitalize. When was the last time you went three days without using technology? Do you know what it feels like for your mind, body and soul to be in the wild? Disconnect to Connect. Detox from Technology. Find the wild within. Join us for an experience that will reset you in mind, body and spirit. READ THE DETAILS AND SIGN UP HERE! Join Cristina and the rooted community on the April 18th New Moon for a guided night walk, meditation and nature communion. This is a very intimate gathering, with guided journaling, refection and sharing. You will leave feeling light, in-tune and with easy rewild education to help you connect with your intuition, nature and community. Are you longing to camp with other conscious people who love nature and the outdoors? Join Cristina and the rooted community for a guided night walk, meditation and nature communion. This is a very intimate gathering, with guided journaling, refection and sharing. You will leave feeling light, in-tune and with easy rewild education to help you connect with your intuition, nature and community. Join Cristina and the rooted community on the April 5th New Moon for a guided night walk, meditation and new moon communion. This is a very intimate gathering, with guided journaling, refection and sharing. You will leave feeling light, in-tune and with easy rewild education to help you connect with the moon. And the best part? Meet like-minded people in your Austin community! Do you want to feel more in tune with your body? Are you longing to understand how tracking and understanding your menstrual cycle leads to a life of intention, clarity and rhythm? Are you wanting to develop new, meaningful friendships with wild women? Join Rae Higgins and Cristina Schooler for a primal rhythms workshop. Come step into Mother Nature with us. Join me in one of my favorite Austin nature spots along the river for this Full Moon Meditation & Manifestation experience. In this two-hour intimate nature gathering you can expect guided meditation sitting along the river, a guided night walk, reflective journaling, and manifesting on the full moon and time to just be in communion with the divine and each other. Donations of any kind help me continue to lead these magical weekly nature gatherings and provide our community with quality education, nature experiences and connection to mother earth. Where: Little Stacey Neighborhood Park ( 1600 Alameda Drive) I’ll be sitting down by the main sign to the park by the volleyball courts. Rewild your life with our weekly night walks in Austin! Join Cristina on the February New Moon for a guided lunar manifestation, education and reflection. On blankets by the river, we will discuss lunar calendars, moon rituals and tuning into nature wherever you are. A personal handout will also be shared to let the information sink in better. No prior experience necessary. This is a time of exploration, openness and an intimate gathering in nature. Meet at Little Stacey Park in Travis Heights Neighborhood. We will be walking a short distance on a well- pathed trail in the neighborhood. Please send payment to PayPal to: PayPal.Me/therootedmethod with subject line February 4th lunar workshop. You will be notified that we received your payment! If you are a part of meetup.com, you can join my Rewild Meet Up Group here! Our meeting point on the first day will be in the Chisos Basin area in Big Bend National Park. Upon signing up for your adventure, you will receive all of the necessary details for your experience. SIGN UP FOR YOUR RETREAT HERE! Transportation: Everyone transports themselves to the park. My team gets there the day before to set up and prepare for everyone. Depending on where everyone is coming from, we can assist you with carpooling. Prior knowledge or experience needed of any outdoor skills: NONE, this trip is designed for any level of outdoor knowledge or skills. Part of the experience is helping you gain more knowledge in the areas of nature knowledge that you are interested in! In this three hour workshop, you will learn ample, practical tools to incorporate more nature into your life. From the mind and body to your kitchen and home, you will leave feeling inspired by the many ways nature supports us! Are you ready to add more wild into your life? All participants have the option of bringing their own tents and outdoor gear for the festival or can just participate in the daily events. Our mission is to provide individuals with a multi-sensory experience in wild environs to ground them in mind, body, and spirit. Get ready to be inspired by the many ways nature helps us lead our most resilient lives. Our goal is to get you the most excited you've ever felt about time spent outdoors. Click here for ticket options and further description! Please click the eventbrite link below to see all of the details! * More details will be coming as we just booked this reservation site! Rest assured, this will be one of our most enchanting experiences of 2018. Spend three days being transported to another world in this incredible park. For decades artists have been inspired by this park and with good reason. The landscapes and colors will enchant you and captivate your soul. In this three night adventure we will be hiking, camping, educating and inspiring each other in the mountains and valleys of this park. All meals ( please read for more information regarding food) Your team will be in Zion one night ahead of time buying all of the food for our long weekend! One night( our last night) at an eco friendly glamping location. Nightly Guided Mindful Discussions with Journal Provided. Please read more about purposeful discussions here. We will be staying in a clamping eco yurt or tent on our last night together! Don't miss out on this magical experience. * Spots will be reserved and limited based on a payment received basis. In our first workshop series on healing from western civilization we will be focusing on color and flowers as a means to help reclaim our wholeness and connection to nature. In this four hour experience you can expect guided color therapy work, a sensory nature walk, eating flowers for lunch and the best part? A full on color therapy bath using natural color from plants. Private artist residence in Travis Heights Neighborhood. Once participants sign up, they will receive address of location. We are two women who want to help human beings reclaim their wholeness & vitality in their world through nature. Through sensory workshops and retreats we rediscover our child-like experience. We curate transformative experiences that are fun & educational. Based on our combined professional and personal knowledge in wellness and the outdoors, we are sharing nature’s gifts as a means of leading our most vibrant lives. This experience is for human beings who are interested in exploring alternative healthy ways to experience entertainment. Maybe you are tired of having Sunday brunches or have explored all of the nature spots in Austin and are ready to take your knowledge up a notch as it relates to your wellness journey. This is for people who might be curious about pure play without alcohol, who want to put healthy food in their body, & want to grow into the best version of themselves. We aren’t about extremes here; We want to provide you with a playful mindful experience so you can incorporate more positive energy in your daily life wherever you’re at in this beautiful life adventure! Welcome with introductions from both Christina Dietz and Cristina Schooler. Sipping on floral & fruit infused refreshments while being guided through grounding breath work from Cristina Schooler. Transformative group color sharing and receiving our affirmations with your personal selected color bottle made from plants & flowers. “Playing with Plants & Color in the Kitchen” mini workshop with colorful lunch of flowers and plants. Your own personal color therapy restorative bath infused with fresh flowers & essential oils. Do I need prior experience with anything related to nature, color or plants? This experience is for any level of knowledge as it pertains to nature, color and flowers. You just need to have been a kid once! A journal, a towel and a bathing suit to change into for your sensory color bath immersion. * We want this to be a very intimate experience therefore we are limiting the number of people for maximum 1:1 interaction with both Cristina Schooler, Christina Dietz and the group. The Rooted Method is thrilled to be partnering with SAKA fitness in an integrative wellness retreat in California's Desolation Wilderness. Join us for a three day experience learning and witnessing how nature helps us reclaim our sense of wholeness and wellness. For two nights and three days we will be backpacking a moderate 12 mile loop in Northern California's Desolation wilderness. Never backpacked before? No problem, that's why we are here. Whether you are an experienced backpacker or never touched a tent in your life, your guides Cristina and Neil will help you along the way. You can expect hiking and camping around four or five different lakes, polar plunging, gourmet backcountry food, breath- work and backcountry skill lessons, just to name a few. Learn outdoor skills with us! Backpacking, Camping, Physical fitness, mindset, we have you covered on this wellness retreat. You’re at the full moon release retreat relaxing on blankets in the grass, sipping turmeric golden milk after your meditative hike. Chances are you are feeling clarity after your private group journaling and reflection. But no matter what you are doing, one thing’s for sure: you're finally trusting the greater forces at work in our magical world. You're receiving of the messages of support from nature, yourself and the group. If your'e a heart centered individual who craves connection, clarity and collaboration then come join your guides, Cristina Schooler , America Mergen and Christina Dietz on this transformative day. In this one day workshop experience is about gaining clarity in and around the blocks in your life. Your blocks can be anything from relationships, money, family, spirituality or creative endeavors in your life. Throughout the whole day you can expect to feel calm, refreshed, nourished and inspired through our guided body work, hiking, yoga and group clarity work. Our outdoor location in Mckinney Falls will give you the opportunity to be present with yourself and others. * You do not need to be present for the whole day to participate, you may come and go as you please during this intimate event. There is also ample room to explore the property, jump in the pool and enjoy the outdoor bamboo shower. I am the founder of The Rooted Method, a holistic camping retreat and workshop business. I believe strongly in the power of outdoor group camping experiences and the truths nature can offer us in life’s most challenging moments. We are thrilled to be partnering and leading you all in this powerful manifesting workshop in the heart of Austin. Christina is a vibrant living specialist. She is certified in integrative nutrition with a holistic health coaching degree, a B.A. in sociology, & certified in a re-emerging self-awareness positive psychology therapy using plant-based Color. Christina is certified & trained as an aura-soma color practitioner from the Color Science Academy in London. She has unique worldly wisdom experience from traveling all over the world while she was younger & solo traveling as she was older studying wellness. She had a life changing transformative experience when she was undiagnosed & sick for 6 years overcoming what ended up being black mold poisoning. Unaware, she instinctually used color in a myriad of practical ways to heal herself emotionally, mentally, & spiritually. Now, she specializes in vibrant living as a lifestyle from diet, self-awareness tools/techniques, mind-body connection, & reconnecting clients with their intuition & true essence via color. I empower, inspire, & give you tools to help yourself evolve your own life from the inside out.The goal is to get you glowing and radiating from within independent of life's up's and down's. * Once you sign up, the details of your experience will be sent out a week prior to the event! We are partnering with Northern Fir, for a full day education workshop on all things outdoors. We will be covering topics related to camping, backpacking, food, health and self care in the outdoors. Northern Fir is a naturally sourced men's grooming company that provides a line of products for the modern outdoor man. All of their products are in mission with keeping it natural, wholesome and keeping sustainable agriculture practices in mind. What's the difference between backpacking and camping? How do I stay clean, dry and warm? If you don't have any equipment that is totally fine but bring your backpack, cooking materials etc if you do have them! * First 10 sign ups receive a free beard kit from Northern Fir! * spots are available on a first come first serve basis. Once we have 30 participants signed up we will close the event. The Positive Thread Wellness Retreat! On this one night retreat we are partnering with Heather McConochie the owner of The Positive Thread- a prominent health coaching practice based in Austin, Texas. During your one night two day experience you will have the opportunity to hike, eat fresh food on rugs, meditate by the river and participate in some guided activities by Heather and Cristina . Your gourmet menu will be provided by Curcuma and Heather herself. Each individual has the opportunity to bring their own tent if they want to sleep alone, or they can stay in one of our spacious tents provided by Black Diamond. Every small detail has been taken care of. All you need to do is show up ready for one of the best outdoor weekends of your life! All of the food is freshly prepared with no artificial additives or chemicals. For a sample menu, click here. If you have food restrictions or requests we can accommodate! Sleeping pad for every participant to take home! What if I've never hiked or camped? No worries at all! Part of our service is to carefully guide you along in this outdoor experience. You will have two very experienced hikers and campers to assist you with any questions or concerns. How will we get to our camp site? Once we have our final numbers, we will send out an email two weeks before giving out the specific campsite and timing information. If you are flying in from out of town, you will be given specific directions. If you are coming from Austin, we will provide caravan logistics. Can I bring my pet or children? While we do love dogs and children, we feel that participants will benefit as a group without any animals or children present. We can never control Mother Nature! If it happens to rain, the retreat will still happen and we will make necessary adjustments. However, safety is our number one priority so if we feel from weather reports that there is any serious weather coming, we will make alternations. Spots are reserved based on a first come first serve payment basis. Once your payment is received, we will consider that your entry. Two weeks prior to the weekend, you will be sent specific information regarding packing lists and logistics. Members of The Positive Thread Sign Up Here ! New Members of The Positive Thread Sign Up Here! Three Nights/ Four days camping, hiking, star gazing and hot springing in one of our nation's most pristine National Parks! Not only will we have an incredible hiking and camping weekend, there will also be built in time for education instruction on all things camping and hiking! This experience for any woman who is ready to embrace 2018 in full force. It's a long weekend of celebrating and exploring all of the parts of us that make us special. It's for those who want to get away from technology to give their brains a much needed break. Maybe you have camped once or twice near your home town. Maybe you've gone on a couple hikes on your vacation. Maybe you've always wanted to go to Big Bend but it seemed like too much of a hassle to plan, organize and execute the logistics. This retreat will take care of everything for you. Just show up ready for an adventure with some rad people. If your afraid of getting a little sweaty, being away from cell service or not into seeing really beautiful mountains and incredible stars. Transportation. We will all meet from designated location and follow each other there or meet at scheduled time if coming from outside of Austin. If you are coming from a location other than Austin and are driving yourself please email us at rootedmethod@gmail.com and we can price your trip accordingly. Click here to email for questions! A full day education and resiliency workshop on all things camping, backpacking and hiking. You can expect to leave this workshop having introductions to all the major topics associated with camping. LB J Historic Oak Grove park located right off Nash Hernandez and Chicon street. It's right on lady bird lake and a big parking lot available. Backpack: What size should I carry? 12:00- 2:00 - BACKPACKING MEALS AND SNACKS. If you are a woman who is ready to up her game in the outdoors, learn new skills and find others in your community then this is the experience for you! Spend one-night camping and hiking experience in one of Texas's most incredible state parks only an hour and a half from Austin. We will hike along some incredible trails, star gaze on the Monoliths, do sunrise meditation while watching the sunrise and cover camping topics to give you deliver the most imperative information for your future camping and hiking trips! This adventure is for women who are looking to experience more time in the outdoors searching for that authentic outdoors experience. It's for the individual who bought all the REI camping equipment from but hasn't used it because they don't know how. This is for the person who has always wanted to camp or hike but is intimidated by the process of setting things up establishing a campsite and outdoors cooking. This is for the person who wants to find an Austin community of high-energy individuals wanting to experience nature. Not to worry! As part of our mission, we ease the burden of planning and executing hiking/camping experiences, so you can just enjoy the adventure. Part of our mission is to ease the burden of planning and executing camping experiences. Cristina and another experienced hiker will be there to answer any all of your questions. Transportation to the park. We will all meet at designated area and drive to location together. * All payments must be made prior to arrival. Spend three days hiking, hot springing, visiting artisan townsin one of our nation's most pristine National Parks! Located about six hours southwest of Austin, this is one of America's most wild and untamed landscapes. On this retreat you can expect to be taken to some of the most diverse desert landscape in the world. You will witness abundant wildlife, diverse mountains and historic Mexican culture, this experience will surely ignite all of your senses and curiosities. Each evening prior or after dinner, Julie will speak, guide and coach us for a 45 minute group session. Julie is an empath, a psychic medium, energy healer, spiritual teacher in the Austin, Texas area. She comes to our campfire with years of working with individuals and groups all over the world. We are so lucky to have Julie, a true healer, on our retreat this weekend! To read more about her bio please click here. This experience is for anyone who is ready to up their camping and hiking game a bit. It's for those who want to get away from technology to give their brains a much needed break. It is for those who are continually on a personal path of self transformation. Maybe you have camped once or twice near your home town. Maybe you've gone on a couple hikes on your vacation. 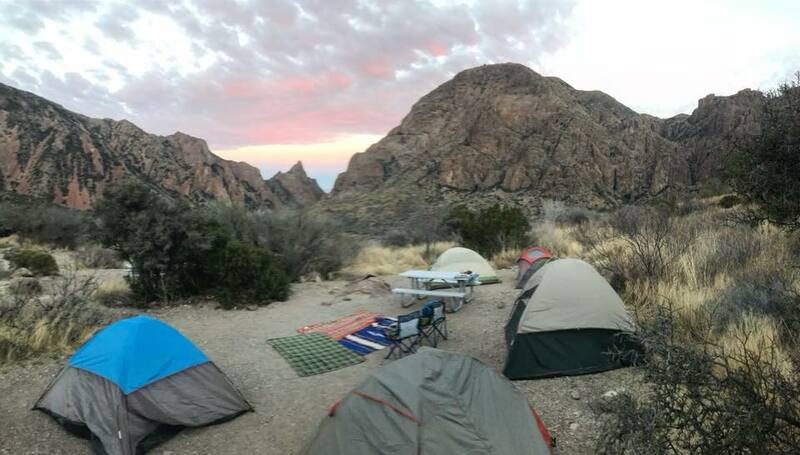 Maybe you've always wanted to go to Big Bend but it seemed like too much of a hassle to plan, organize and execute the logistics. This retreat will take care of everything for you. Just show up ready for an adventure with some rad people. Each day we will hike, however, the hikes aren't super strenuous and were chosen for maximum views and accessibility from the campground. If you do not wish to hike one day, you are more than welcome to hang at the campsite on our comfortable rugs and pillows to read a book. Whether you are an experienced hiker or never camped in your life. you are about to embark on a one-of-a-kind adventure. Transportation. We will all meet from designated location and follow each other there or meet at scheduled time if coming from outside of Austin. Depending on how many people we have, we will caravan in groups. All of your gas will be covered by Rooted Retreats. If you are coming from a location other than Austin, please email us at rootedmethod@gmail.com and we will deduct gas from your cost. A full day education workshop all about backpacking right in the heart of Austin! Not only will we learn together, we will also have time to hike the park and do a polar plunge in the falls for those interested! Backpack: What size do I bring? 12:00- 2:00 - Backpacking meals and snacks. We will eat what we cook! 1 Night Hiking Retreat in Colorado Bend State Park! 1 night hiking adventure in Colorado Bend State Park! Located about two hours from Austin, this magical park has rivers, rolling hills, caves and kayaking. We will spend Saturday afternoon hiking and jumping in swimming holes( for those who want a polar plunge!). At night we will sit by the campfire, engage in guided discussion and eat amazing food from Curcuma. Sunday we will hike to Gorman falls, eat lunch in the wide open landscape picnic style and do gear demonstration for those that have questions. For this adventure, Katherine Kiraly, owner of Reel Texas Productions, will be joining us on the trails! She will be interacting and teaching throughout the hikes and in our down time, focusing on the basics of shooting in the outdoors. This is a chance to hone your outdoor skills, beginner or professional. Throughout our hikes and at night we will all be able to collaborate and learn from each others personal and professional backgrounds. Each of you will leave with high quality photos of your experience. This will be a very intimate weekend with lots of 1:1 time with both Katherine and myself to answer any of your outdoor adventure questions or concerns. Not to worry! Part of our mission is to ease the burden of planning and executing camping experiences. Cristina will be there to help, guide and answer any of your questions. All of the food is freshly prepared from Curcuma. There are no artificial additives or chemicals. For a sample menu, click here. If you have food restrictions or requests we can accommodate! Transportation to the park. We will all meet at designated area and drive to location together. Your gas will be covered, if you aren't coming from Austin, you will be reimbursed directly or just let us know prior to the trip. * Spots will be on a first come, first serve based on payment received. No more than 10 people will be admitted in order to keep the experience intimate. 1 Night Hiking Retreat to Hill Country State Natural Area! Tucked away in the rugged terrain southwest of Bandera is Hill Country State Natural Area, an undeveloped and secluded retreat. Approximately 40 miles of trails wind up grassy valleys, cross spring-fed streams, and climb steep limestone hills. Equestrians, hikers and mountain bikers can enjoy exploring the trails. 1 Night camping and hiking experience in a pristine Texas park only two hours from Austin. We will hike along a beautiful canyon, eat deliciously prepared food, learn more about camping and hiking skills, watch the stars and have meaningful conversation by the camp fire. We will do several 2-3 mile hikes in the area( none are overly strenuous and can be for all levels. ) In the morning there will be optional guided meditation and in the evening there will be time for community reflection. Katherine from Reel Texas Productions will be taking photos for you so you leave with some tangible memories! This adventure is for anyone looking to experience more time in the outdoors. It's for the individual who bought all the camping equipment from REI but hasn't used it because they don't know how. This is for the person who has always wanted to camp or hike but is intimidated by the process of setting things up. This is for the person who wants to find an Austin community of high energy individuals wanting to experience nature. Not to worry! Part of our mission is to ease the burden of planning and executing camping experiences. Cristina and another experienced hiker will be there to answer any of your questions. * Payments must be made in order to reserve a spot. Clic here to email for questions! Colorado Bend State Park is a hidden Texas gem! Located only a few hours from Austin, this spot will make you feel very far from Austin, Texas amongst the golden leaves and rolling hills. 1 Night camping and hiking experience in a pristine Texas park only a few hours from Austin. We will hike along a beautiful canyon, eat deliciously prepared food, learn more about camping and hiking skills, watch the stars and have meaningful conversation by the camp fire. We will do several 2-3 mile hikes in the area( none are overly strenuous and can be for all levels. ) In the morning there will be optional guided meditation and in the evening there will be time for community reflection.